Laser cutting and welding, like the names imply, use lasers to get the job done. Laser optics and computerized controls direct laser beams to the material being worked on. Depending on the material and the parameters that are set, the beam can melt, burn, cut, or vaporize the material leaving a very high-quality edge finish. Industrial laser cutting and welding can be used on a wide variety of materials including: alloys, aluminum, brass, carbon steel, copper, nickel, stainless steel, titanium, tungsten, and platinum among others. The process is best suited for flat-sheet materials, structural pieces, and piping. Its’ closest competitors are plasma cutting and water jet cutting. Lasers can also be used to weld metals and metal alloys as an alternative to TIG welding. This method sees a focused beam heat the surface of the material to the boiling point to create a keyhole. The keyhole makes it easier to create a bigger hole, very quickly. As the hole gets deeper, the material boils and vapor erodes the walls to make the hold bigger. Vaporization is best used materials that don’t melt, like wood, carbon, and certain plastics. Melt And Blow/Fusion. This method of laser cutting uses high-pressure gas to blow molten material from the cutting area. The material is first heated to the melting point, and then blown out of the kerf with a jet of gas. This method eliminates the need to raise the temperature of the material any further and has decreased power requirements. Best for metals. Thermal Stress Cracking. Here, the laser beam caused localized heating and thermal expansion resulting in a crack that can then be guided by moving the beam. Good for brittle materials like glass. Reactive Cutting. Also called flame cutting, this process is similar to Oxy Fuel cutting, but instead of oxygen and a fuel gas as the ignition source, the laser beam is the source. It is very effective on thick steel plates. Laser cutting and welding provide reduced contamination of the piece or materials and better precision than other cutting and welding methods. Lasers tend to use less energy than other methods and create little to no material warping due to having small heat affected zones. Good option for intricate parts cutting. Very high degree of accuracy; good for repeat processes and consistent, reliable welds. Close nesting means less material waste. Little to no joint preparation is necessary. Little to no finishing required post-weld. No filler material needed to join dissimilar metals. Cannot cut through extremely thick metals as well as plasma cutters. Can be more expensive than other processes. Production rates depend on the material. Careful calibration is necessary to avoid burning the materials being worked on. May be difficult to cut reflective materials. Are you expanding into laser cutting? Do you need additional safety supplies to protect yourself from heat or rays? Visit Josef Gas online or in person at 201 Basaltic Road in Concord, Ontario to learn more about laser cutting. 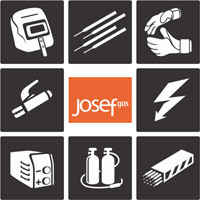 We carry machines, supplies, safety gear, and more to keep your shop running smoothly!